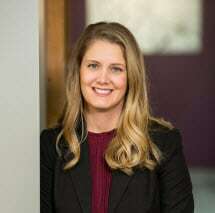 Amanda R. Hespen practices in the fields of estates and trusts, probate and trust Administration, small business formation and succession planning and guardianship/conservatorship. While she attended William Mitchell College of Law, she volunteered for the Minnesota Justice Foundation and clerked for Jeffrey Scott. Amanda has a clear, straightforward, and understandable approach that clients repeatedly comment on. She oversees the postmortem administrations of trusts, and prepares interim and final accountings for conservatorships, special needs trusts, and probate estates. Amanda grew up in Rice, Minnesota on a family farm. She enjoys spending time with family and friends, spending time at the lake, reading, films, and is a fan of the Twins, Vikings, and the Wild. She resides in the Blaine area with her husband and two children. Amanda was recently featured in Attorney At Law Magazine. Read the article by clicking here.